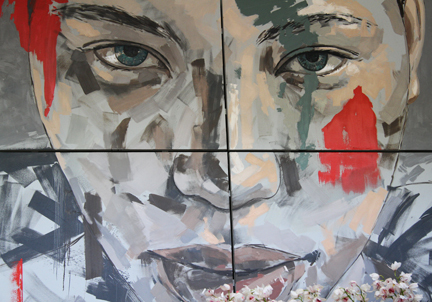 Calling All Wine, Art & Diamond Lovers! This should cover a lot of you, so I am expecting an extra-large number of readers today. 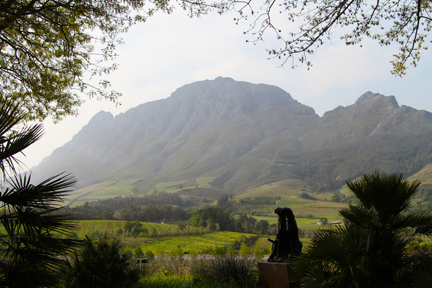 If you fall into one or all (like me) of those categories, then Delaire Graff Estate in Stellenbosch, South Africa is a definite destination spot for you. Laurence Graff, known to many as the “The King of Diamonds” is one of the few humans in the world that can spot a flawless stone with his bare eyes. No loop required. So how does this translate into his estate nestled into the wine country just an hour outside of Cape Town? The answer is – flawlessly. He has not missed a single detail of perfection. From the villas, to the gardens, to the museum quality art collection, to the food, to the wines, and last but not least the impeccable service – we could not have been more impressed. 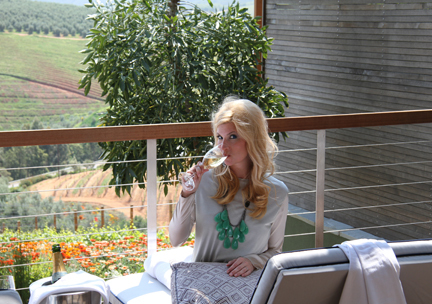 Though our stay was short, Brett and I took advantage of everything Delaire had to offer. To be honest, any length of time would have felt too short. Here is the story of our stay summed up in photos. The pictures speak much louder than my words. View of the vineyards from our villa. Taken while sipping on the champagne that was waiting for us in the room upon arrival. I love the way these people think. Brett flipping through the Graff Diamonds coffee table book in our living room. That incredible view (from the previous picture) is just in front of him. Although, I prefer the view with him in it! Enjoying the bubbly and the warm clean air. I took on a whole new appreciation for air quality after moving to Beijing. It is the small things in life, you know? Like being able to breathe. 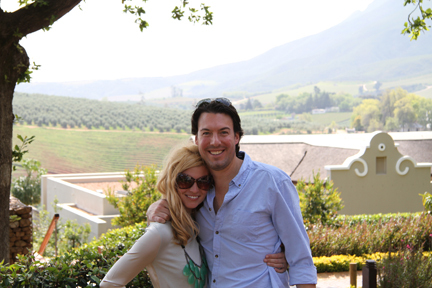 The happy couple right before our wine tasting commenced. You can tell because our teeth and lips are not purple yet! I know you are supposed to spit it out...but who does that on their honeymoon? Our view during the wine tasting. Just stunning. Touring the cellar... Apparently, I got confused and thought we were taking a dance team picture. 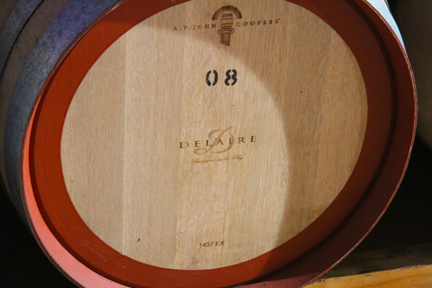 A pristine 2008 red wine barrel at Delaire Graff Estate. On our way back to the villa to rest and freshen-up before dinner I made a quick stop to kiss the iconic statues of Delaire. 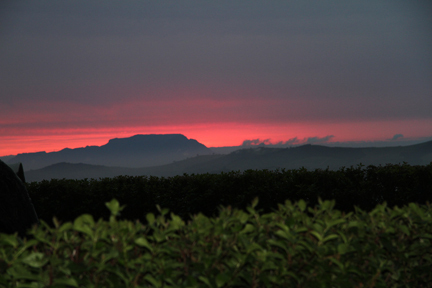 Sunset at Delaire Graff Estate. Our view as we walked to dinner. Dining at the Delaire Graff Restaurant for dinner. We chose Indochine for lunch which was also very tasty. The decor of both spaces is lovely. 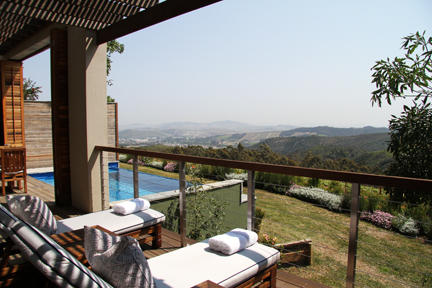 Be sure to check our Delaire's dining options for even more images of the property. Breathtakingly beautiful. 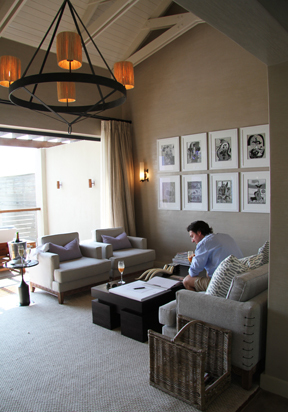 Sadly, our stay at Delaire had to come to an end. It was certainly too short! But the adventure continues. 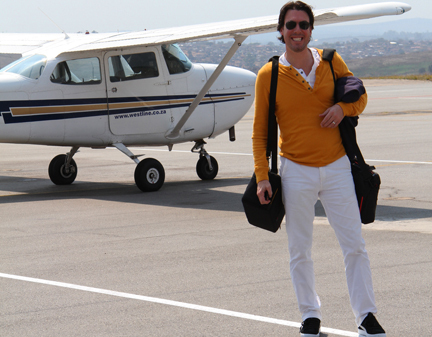 Here is Brett boarding our tiny "crop duster" to take us to Chitwa Chitwa Private Game Lodge. Let the safari begin! Stayed tuned for lions, leopards, and ellies galore! ← Flying South for the Holidays? Love this…feel like I’m there as I read it…only I’m still sober!! !